I love working out with DVDs. It's fun to have company while you workout and the hosts can be very motivating, especially when you are getting tired. Sometimes, however, I want to kill 2 birds with one stone when I work out. Maybe catch up on a TV show or listen to a podcast. 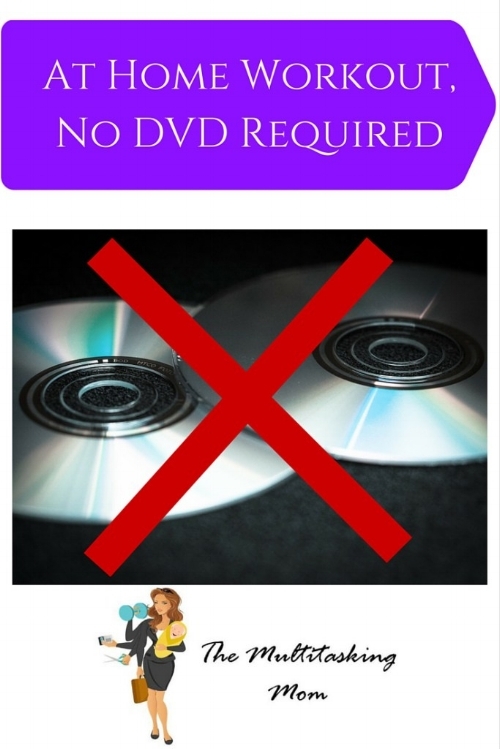 This is not so easy when using a workout DVD. So, I came up with a set of workouts that includes weights and cardio and doesn't require a DVD. The whole workout gets done in about 30 minutes. All you need is 3 sets of weights and a clock. I use the cable box as my clock. First, I pick an area of the body to focus on: legs, or back and chest, or shoulders, or biceps and triceps, etc. Then I pick out 7-8 exercises that I will do to work out this area of the body. So for biceps and triceps I might do: bicep curls, tricep dips, hammer curls, tricep kick backs, reverse curls, overhead tricep extension right, overhead tricep extension left and isolation curls. For shoulders, I might do: shoulder press, side raise right, side raise left, front raise, bent over fly, upright row, and arnold dumbbell press. Here's how I set up my workout. The first 2 minutes I warm up by jogging in place. Then I grab my light weights and do 12 reps of the first exercise. As soon as I'm done I finish out the minute with either jogging or jumping jacks or quick jump rope type hops. When that minute ends I grab the medium weights and do the same exercise for 10 reps. I again finish out the minute with cardio. At the next minute, I grab the heavy weights for 8 reps. Again I finish out the minute with cardio. I repeat this process with all 7-8 exercises. This should bring you to about 23-26 minutes depending on if you are doing 7 or 8 exercises. To round out the 30 minutes, I always end with abs. In this case I will do say 20 crunches, or 12 lying leg raises, or a 30 second plank and then again finish out each minute with cardio. At the very end I will do a stretch and I'm done. The stretch I do depends on the area I was concentrating on for the day. Once you've done this workout a few times, you kind of get the hang of it and you can actually enjoy your show or podcast while you workout! If you don't have 3 sets of weights, no problem. Just do 10 reps with the same weights for all 3 sets of each exercise. Don't worry about the specific order, just keep in mind the area you are focusing on and do the next exercise that comes to mind. For days where I am working 2 muscle groups, like biceps and triceps or chest and back, I like to alternate between the body parts. So after 3 sets of bicep curls, I might do 3 sets of tricep dips and then switch back to biceps. That way I don't over tire the muscle. Try this out and let me know what you think. Need ideas for which exercises to do? Drop me a note in the comments!